This month, a simple wish was fulfilled for Cleveland, Ohio resident and Life Choice Hospice patient, Martha B. Life Choice Hospice discovered that Martha had been a lifelong art lover and set in motion a plan to create a memorable moment for her. 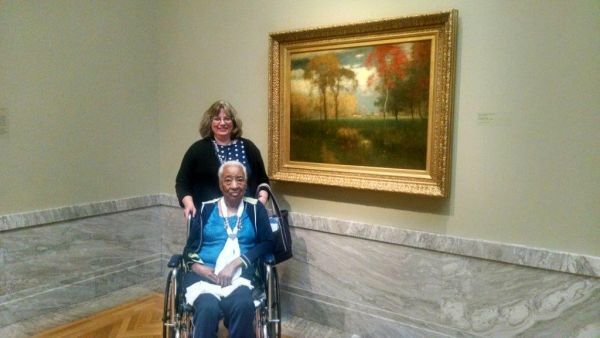 Her Registered Nurse Mary and Spiritual Care provider Kathy planned a day trip and lunch at the Cleveland Museum of Art. She arrived after a leisurely tour of the city that she had not seen for many years to a VIP tour of the museum with a dedicated guide to see the Chinese and African art that she loves so dearly. She was able to enjoy a lunch and coffee in their bright and sunny atrium with a walk outside to the beautiful museum grounds abounding with fall colors. The day was thoroughly enjoyed by Martha and our team was honored to be a part of this moment that brightened her day.